One of the age-old literary conflicts: What food to serve at book club? Naturally, since the book you will be reading and discussing is Dinner: A Love Story, it stands to reason that you should make a DALS recipe, am I right? And I don’t know about your book clubs, but mine generally meets after dinner which means that the host is responsible for providing a simple spread: some kind of treat, maybe a little cheese, and, of course, wine. 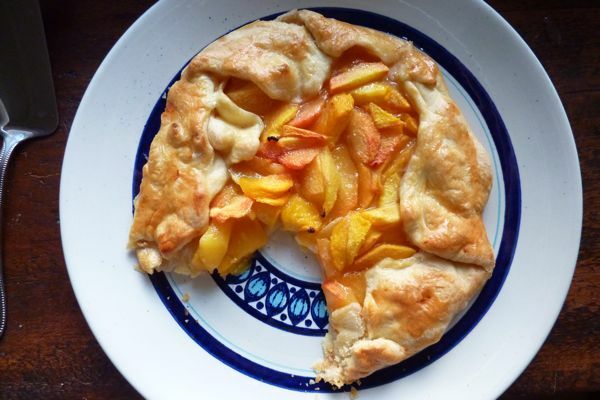 Though I haven’t tried this one out on my group, I’m guessing that the above ginger-peach galette, when served with a nice dry German Riesling, will hit the mark. You loved “The Acknowledgments.” Apparently, there were many many tears when I thanked Andy and the girls. As any writer will tell you: Tears=major victory! You loved that potholder! Oh man, so do I. I wish I could remember which of the girls made it for us, but instead I’ll just give them both credit. In all seriousness, thank you for the feedback. I’ve taken the liberty of compiling some additional common themes into a discussion guide for your book group. And also, if your group is more than five people and has any interest in me calling in during the discussion, I’d love to say hi. (Email jenny AT dinneralovestory DOT com with the subject “Book Club.”) In fact, if you decide to make the galette, I might not have any other choice but to invite myself over. Click here to buy Dinner: A Love Story. How funny! I really did pick your book for my book club last week! I worried that the others might think a “cookbook” a strage choice, but since I’ve never before read a cookbook cover to cover with such joy and enthusiasm, I thought they might feel the same. And they did! By the way, I made a peach pie (my one superpower), and with leftover crust, put a bottom crust to the peach and blueberry cobbler you recently posted (with some blackberries, too). Both were yummy! 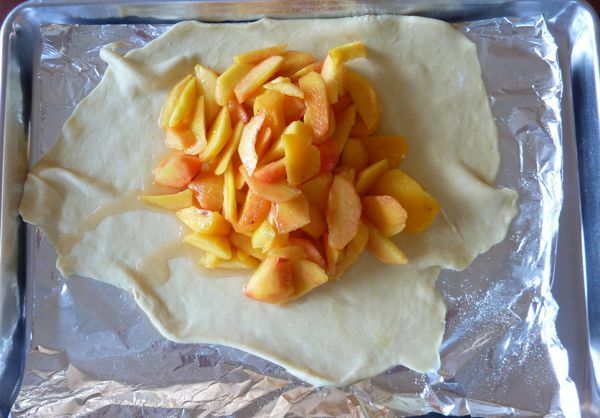 The morning coffee has apparently not kicked in yet, and I’m having trouble finding the recipe for the ginger-peach galette. Can you help a mutha out?? Anne – If you click on the link at the bottom it will download the PDF for the recipe (and the discussion guide). Enjoy! I wanted to add that Cora, my just-turned-one-year old, adores your book. She’s very into raiding our adult bookshelves for interesting things to “read”, and flipping the pages of DINNER: A LOVE STORY keeps her occupied for a good ten minutes. Honestly your ‘3 year old dinner rule’ changed my life. I could feel the guilt melt off my shoulders. I then took the liberty of adapting your rule in my head for boys – I’m thinking 4 is better. Look, I know girls can be just as high energy but the reality is toddler boys do. not. sit. ever. Period. You should see how many post its I have sticking out of your book right now – some for the recipes to make, some just for reaffirmation that I am doing a decent job. Thank you, for that! 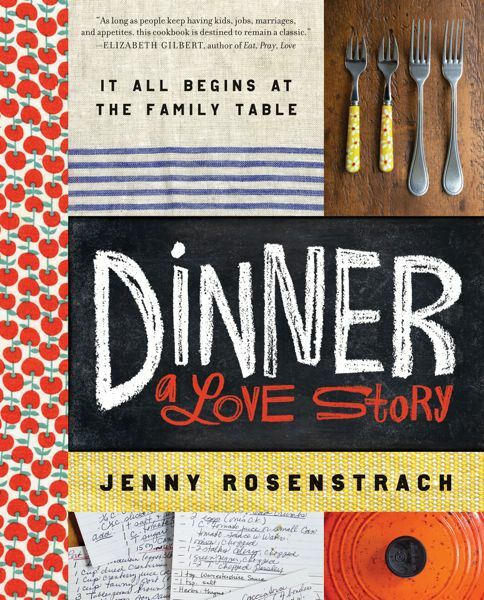 Jenny – I’ve been meaning to write about how much I enjoyed your book, and how much I truly think it’s book club worthy! I guess I’m not the first to say that yours is the first cookbook I’ve ever read cover to cover. And even if I never made any of the recipes (too late! ), it would have been worth every penny. Our children are about the same age and stage and I found myself howling (and weeping) at so many of the common experiences of modern marriage and parenthood that you describe so beautifully and earnestly. And I am with you 100% on “no family dinner before age 3 required.” Oy! Life is long. Put ’em to bed and have a drink with your man. Thank you for sharing your tremendous gifts with the rest of us in such a heartfelt way. I’ve got my “new baby” gift at the ready for years to come. I hope it’s a NYT bestseller! P.S. My new sister-in-law is “jillybean.” We both discovered we were fans of your blog before she married my brother, and I’m pretty sure the news of her DALS devotion made me sure she was “the one” for him! I’m also writing to inform you of our other drink, the one we were drinking before the Dark and Stormy page in your book. The Big Ginger. Fill your usual Dark and Stormy glass with ice, then fill halfway with 2 Gingers. Squeeze a wedge of lime and one of lemon, drop those in and fill to the top with your gingerale of choice. Very summery. I got mine in the mail today…. I read it from cover to cover. The last paragraph is what got me, almost as much as the potholder. I sat holding your beautiful book for another hour just thinking…. they are only scallops. Hm, well, we have family dinner with our son, who’s not yet three, and he gets served what we eat (usually with a side of fruit). It works for us, but on the other hand, I am home most days, and lunch is frequently catered to his taste. I wonder if that helps with battles at dinner, if it’s a control thing as much as a taste thing. If the 3-year-old rule makes life easier, then I don’t see anything wrong with it. I like your book a great deal, and I especially like the non judgmental attitude. Moms judge themselves harshly enough already without some other mom piling on. I didn’t enter the contest, but my favorite part of the book was your appreciation of how your father always, always, made it home for dinner, even before he was in charge of making it. My husband makes the same effort (sometimes leaving work before 5 to beat traffic), and I and our son also appreciate it very much. 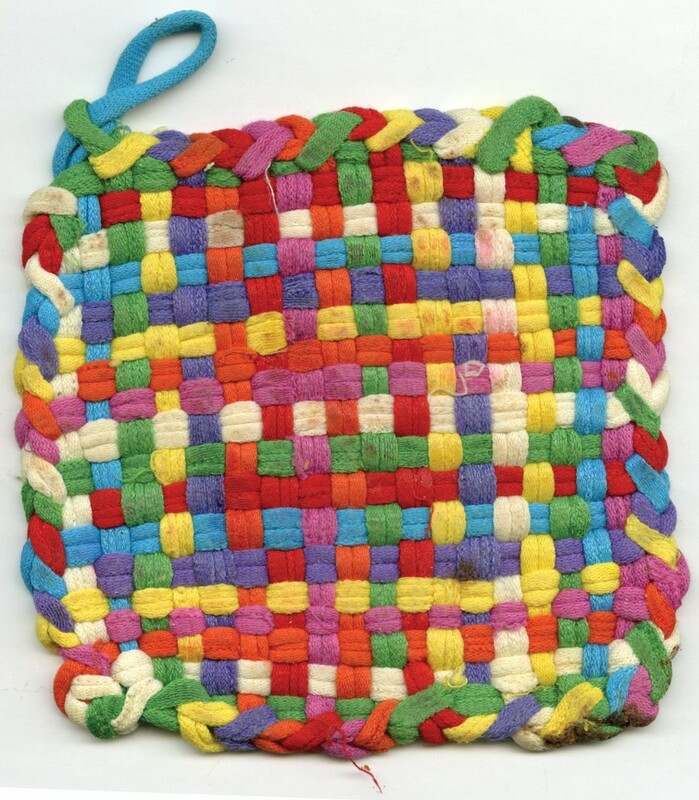 Ah, the stetchy loom potholder. Treasure those things! Not only are the very best potholders EVER, but everytime you use one you will remember when they were little enough to be enthralled making them for you and then how excited they were to give you each new color combo. I think I still have two or three functional ones and my girls are now 31 & 27. I can’t wait to buy the kits for grandchildren in the future to keep the cycle going.